Practical Transformer Handbook shows how a transformer can be put to use, common problems which a user will face, and which is the most appropriate in a particular situation. Anyone working with transformers will find this a valuable user guide. Theory and mathematics are kept to a minimum, and instead the everyday working of these devices is described. 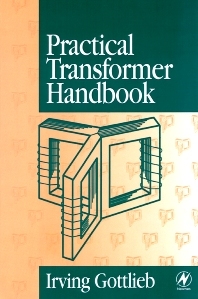 Practical Transformer Handbook covers transformers in electronic technology, control techniques, instrumentation, and other more unusual applications. In this practical book a wide range of devices, uses and problems are explored, from parametric transformers, transmission line RF transformers and Tesla coils to the effect of geomagnetic storms on power transformers and dealing with the ever-present third harmonic in iron core transformers. Irving Gottlieb is a leading author of many books for practising engineers, technicians and students of electronic and electrical engineering.